Vegas police officials revealed on Monday that their previous belief that Paddock committed suicide when confronted by a security guard after killing nearly sixty people is incorrect. They now know that Paddock shot security guard Jesus Campos BEFORE he began shooting at the concertgoers, which raises many more questions, the first and most important of which, in my opinion, is why did it take police twenty-six minutes to get to Paddock if the security guard had made a radio call to casino dispatch informing security and police of his being shot, exactly where he was and which room the shot came from? Paddock did not begin shooting at concertgoers until six minutes after he shot Campos, meaning that police knew there was an active shooter at Mandalay Bay, they knew exactly which room he was in, and yet it took them 26 minutes to get to him, only to find him already dead from a self-inflicted gunshot wound when they arrived. Why? Six minutes seems like more than enough time for an armed force to break into Paddock’s room and prevent him from killing 58 people and wounding over 500. Yet, he was spraying innocent people with bullets for twenty minutes before the police got to his dead body. Why did police fall back? What were they falling back from? Paddock could only shoot through the door. Why not rush the shooter? You have body armor. Why not evacuate the adjoining rooms and use one to shoot through the wall to take Paddock out? Why couldn’t a flash/bang grenade and/or tear gas have been lobbed through the open windows from the unit above? 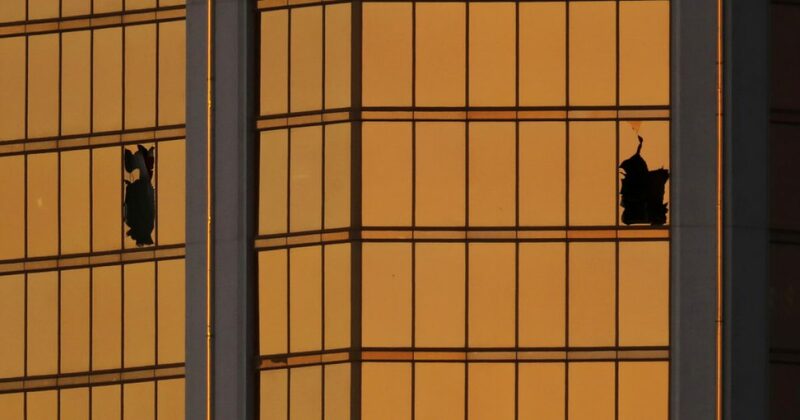 Why weren’t there snipers all over the area to take Paddock out or at least disrupt his fire when he presented himself in the open to shoot more people in front of the broken-out floor to ceiling window? Why did it take SWAT so long to get there? Why did they wait an hour after Paddock stopped shooting to blow down the door and enter the room to find Paddock had killed himself an hour earlier (obviously Paddock’s last round was the one he used on himself)? What if Paddock had not killed himself? Would he still be in the room shooting at people? Would the police still be outside scratching their chins, wondering what to do? So far, at best, it seems like police were standing around outside Paddock’s room wondering what to do while Paddock spent 20 minutes killing innocent people. Please add your thoughts in the comments section, below. Update: On October 9, 2017, Las Vegas Metropolitan Police Department Sheriff Joe Lombardo amended previous statements to clarify that Jesus Campos was shot before Stephen Paddock opened fire on concert-goers. Campos remains credited with informing police of Paddock’s location. Campos was was shot at 9:59 p.m. Lombardo said, and Paddock began firing on the crowd six minutes later. “We received information via their dispatch center… that helped us locate where this individual was sequestered,” Clark County Sheriff Joseph Lombardo told reporters Tuesday. When Campos first arrived on the 32nd floor, he did so by elevator because Paddock had somehow blocked stairwell doors leading to the hallway outside of his room, Hickey said. He had come the floor to respond to an open door alarm, Undersheriff Kevin McMahill said at a press conference on Friday, when Paddock shot Campos in the leg. McMahill praised Campos, and called for more recognition for the man who made it possible for police to located Paddock. About an hour after Paddock quit firing, a SWAT team gained entry to the suite by blowing the doors off with explosives. Paddock was found dead inside from a self-inflicted gunshot wound. Without Campos’ action, the mass murderer’s rampage that killed 58 people could have been even more deadly. Hickey lauded Campos’ bravery on Wednesday afternoon. Campos was struck in the right leg where the bullet remains, Hickey said, and will be removed by surgery at a later date. Campos was well enough to try to leave the hospital not long after the shooting, but was kept there by staff and police who wanted to monitor his injury and interview him about his ordeal. “We just want to make sure that Mr. Campos and all of our officers are recognized for what they do every day, which is protect people,” Hickey said. On any given shift, 17 of 200 officers at the hotel complex are armed, Hickey said. Campos likely just had a nightstick, useless against a man who had a military-grade arsenal at his disposal.